The email came from a woman who’d had enough. Her husband, she said, had been collecting menus for decades, their garage was full of them and now he needed to get rid of them. They were considering the dump. Did I know anybody who’d be interested? “Hon! What are those boxes in the garage?” asked my husband, several days after he returned from a lengthy business trip. “Uh, menus?” I told him, trying to ignore his raised eyebrow and look of utter derision. What I didn’t tell him was that I’d been patiently waiting for him to leave town before I dragged my best friend — and her minivan — to the menu collector’s house to pick up my precious booty: 20 sturdy boxes filled with colorful menus from near and far. “Near,” as in the Pantley’s on Edmonds Bay, a place I’d never heard of, though I might have enjoyed its $12.95 Wednesday seafood buffet and a walk home afterward, had I lived in my house in 1985 when my new best friend snagged a menu. 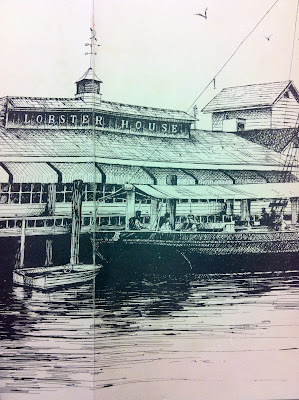 “Far” as in The Lobster House in Cape May, N.J., where I’d certainly have enjoyed a steaming kettle of local shellfish: the “Schooner Dinner” I served to tourists in 1978, when I waited tables at the historic waterfront seafoodery while wearing a white uniform with a sailor collar. Oh, how my eyes lit up when I saw that one. There were menus from Mexican restaurants throughout the South, chains known across the land and — be still my heart! — a treasure trove of Seattle restaurants gone but not forgotten. 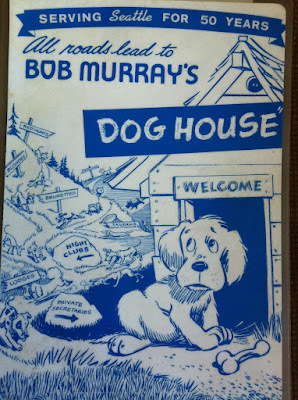 I found illustrated menus from Bob Murray’s Dog House (“We serve breakfast any hour of the day or night”) and Andy’s Diner (whose Prime Steak is “broiled to create a penetrating heat which simultaneously seals in the rich juice”). Ooh, look! There’s one from Matzoh Momma (“Oy, such a FANCY SANDWICH”) and another from Mad Anthony’s, home to “provisions & quenchers” including “Colonial Game Pye” (you may know Anthony’s progeny as a purveyor of Northwest seafood). All roads (used to) lead to the Dog House. And how I miss having Sunday brunch at Matzoh Momma’s. There were menus from Rosellini’s Four-10 (“Victor Rosellini invites you to try our specialty of the day”), Rosellini’s 610 (featuring Geoduck Portugaise, among the many fresh seafood dishes “subject to season”) and Labuznik (back when Peter Cipra’s Tournedos Rossini, with madeira sauce and liver mousse, cost $11.95). Is there anything more thrilling than holding a piece of history — a treasured memory — in your hand? We think not. Which is why, as I slowly work my way through those boxes, I’ve thrilled to the sight of menus that are forerunners of those in my own extensive collection. Like the one from Tai Tung, back when a bottle of Blue Nun ($11.50) was the perfect complement to chop suey ($5). And another from Ivar’s Indian Salmon House, where that same sweet liebfraumilch would have gone well with “English-style Shrimp Currie” ($6.50). Blue Nun. Lancers. Asti Spumante. 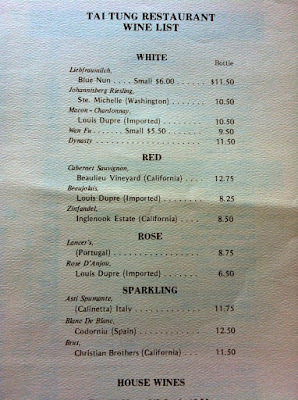 Remember when those wines were the height of sophistication? Well, then: you must be even older than I am. I know I’ll cherish the classic from the original El Gaucho, dated 1977, when chateaubriand for two carved tableside cost $29 and manager Paul Mackay’s name is listed on the menu. Today Mackay owns El Gaucho steakhouses in Seattle, Bellevue, Tacoma and Portland, where chateaubriand-for-two will set you back $125. The Gauch, back in the day. 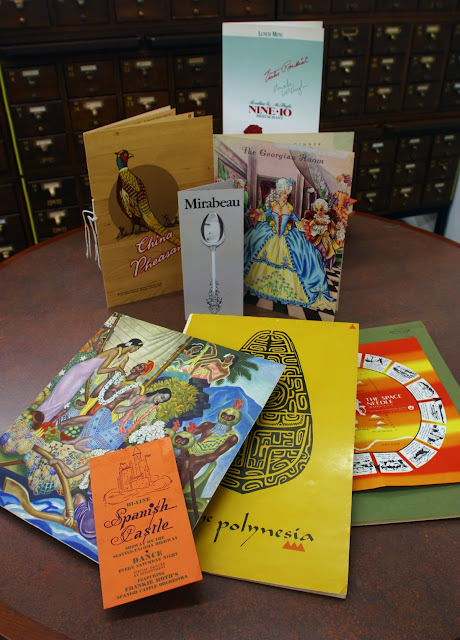 Those with an interest in old menus and the stories they tell should schedule a visit to Seattle’s Central Library, where the reference librarians will allow you to ogle (and handle) their Seattle Room Menu Collection dating back to the 1940s. The University of Washington library has among its special collections menus, place mats and other graphic materials from restaurants throughout the Puget Sound area — the oldest among them from 1889. You may access the collection digitally through the UW library website here. Or check out some of mine via this Seattle Times photo gallery. My husband feels her pain. And when the time comes for us to downsize, I know how I’ll respond to that query: I’m gifting my collection to the libraries. But wait, there’s more! — here in my garage, for now. So, tell me: Do you have any memorable menus you’re saving for posterity? Where are they from, and what made you save them?